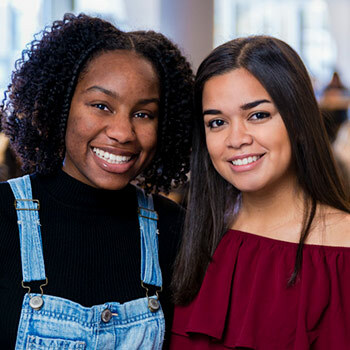 Georgia Southern University (GSU) student dons Sakinah Omari and Rebeca Gonzalez say Tim Horton’s coffee, poutine and snow prove that you don’t have to leave the continent to have a cross-cultural experience. Omari and Gonzalez spent the fall 2017 term as residence dons at Laurier’s Waterloo campus, an exchange program founded by Laurier’s Director of Residence Chris Dodd (BA ’92). Dodd worked with colleagues at GSU throughout 2012 to establish Laurier’s first and only student-exchange program partnership with a university in the United States. It’s also Laurier’s only student-exchange program exclusive to student dons. The Department of Residence was losing experienced student dons to study-abroad opportunities. If learning on a different campus had appeal, Dodd thought donning on exchange could as well. Laurier welcomed the first GSU dons to the Waterloo campus in the fall of 2013 as two Golden Hawks flew south to their posts as “resident life assistants” in Statesboro, GA. The first student Gonzalez met at GSU was a Golden Hawk student don on exchange and it’s what inspired her to apply to the program. For Omari, hearing about life at Laurier from her Canadian counterparts was all she needed to start the exchange program’s application process. Both Gonzalez and Omari have previous don experience, a prerequisite of the Laurier-GSU exchange program. Although Laurier has been home for only one term, they understand the issues that students in North America face. She was heavily involved with GSU’s track and field program during her first year of studies. The rigorous training and competition schedule, combined with homework, left little time for socializing. Omari wanted to change that during her time at Laurier. She got involved with the Association of Black Students (ABS), developing a strong network of friends inside and outside the classroom. As an international student twice removed from home, Gonzalez sympathizes with challenges unique to foreign students. She’s a global student ambassador at GSU, promoting intercultural understanding and helping students new to the U.S. become familiar with American culture. It’s a skill set that’s helped Gonzalez answer questions from Laurier students about life in the U.S.
“I’ve been asked about things like gun control and President Trump,” says Gonzalez. While there are similarities between GSU and Laurier, Gonzalez and Omari have noted some definite differences. Omari was surprised by the layout of the Waterloo campus, which is mostly situated within one city block. GSU’s campus is spread out over a large section of the city of Statesboro. Students often take the bus to get from class to class. Gonzalez experienced her first snowfall at Laurier, something most students in southeast Georgia don’t see. Even during the winter months, Statesboro’s average temperature hovers around 16 degrees Celsius. Gonzalez and Omari say that the Laurier dons at GSU this fall will have likely experienced a few firsts. For one, GSU’s fall term is scheduled differently than Laurier’s. Classes began Aug. 21 – almost three weeks earlier than the start of term at Laurier. There’s no break in the semester until American Thanksgiving at the end of November. GSU students were off from Nov. 20-25, returning to campus with only a few classes left before the term’s Dec. 5 close. Final exams are finished by Dec. 12 but Laurier’s students could have exams scheduled through to Dec. 22. The scariest first would have likely been experiencing the aftermath of Hurricane Irma. Irma wreaked havoc on the Caribbean and parts of Florida before hitting Georgia as a tropical storm. The university closed its campus from Sept. 8-15 ahead of the storm’s arrival. Fortunately, the storm only caused minor damage to GSU’s campus and classes resumed Sept. 18. Gonzalez and Omari will return to Georgia just in time for the holiday break. Although they’re leaving classmates and new friends behind, Gonzalez and Omari say they will always feel the Laurier love.